Michigan’s volunteer opportunities are as numerous as its lakes. So if you’re in the Wolverine State and planning to do some good, we’re here to help you out. 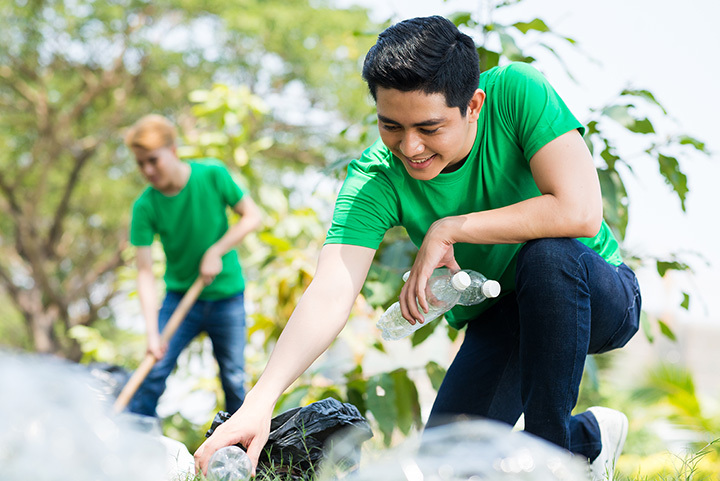 From volunteering your time at self-help centers, to going green, to “paying it forward,” there is abundance of ways to give back to the community. Here are 15 great places to volunteer in the state. Founded back in 1989, Detroit's Arts & Scraps program serves two purposes simultaneously. Not only does it teach children about art, but it also shows the value of recycling via reuse. Recycling over 28 tons of industrial material every year, Arts & Scraps offers a storefront that gives kids ready access to the best of these materials that can be reused in art. There are even some specific events at various times of year that interested volunteers can get in on. Negaunee is where you'll find the headquarters of the Retired & Senior Volunteer Program, or RSVP. Offering volunteer programs specifically for those aged 55 and older, RSVP matches volunteers to various opportunities based on their skills and interests and thus produces the best fit between the two. With plenty of opportunities on hand, there's a lot to do, and plenty of people willing to do it. Part of Mercy Corps in Grand Rapids, this is a great volunteer opportunity for those with business experience. MicroMentor allows business professionals—both current and former—to offer up their skills and experience to help small businesses solve problems, address markets, gain footing and ultimately expand to the point where they can offer jobs to people who so badly need them. Since it's a virtual volunteer position, it can be done at any time, and MicroMentor will work with volunteers' schedules to get the best results. Traverse City is home to this option in volunteering, and for those with a love of horses, this is a great stop for you. An organization focused on equine therapy, it's geared mainly toward veterans and their families, offering those folks access to horses and agriculture to address various issues veterans and families may be facing. Naturally, such an organization needs volunteers at just about every level for the care and feeding of horses and the organization as a whole. Physician, heal thyself. That's an old motto straight out of the Bible, and it's a point that's made many take notice over the years. Battle Creek has a volunteer opportunity that exemplifies this concept, and not just for physicians. It's the Drop-In Self-Help Center, and those who volunteer here will step in to provide help for those who need just about anything from mental health to addiction help, providing necessary resources for those who need help to, indeed, help themselves. It's not a completely self-guided process—professionals are part of the picture—but for those getting started to getting better, this is one great place to begin. Though the name makes it sound a little obvious, this project in Detroit has been focused on bringing a little green back to not just Detroit, but to the region as well including Highland Park and Hamtramck. The Greening of Detroit has brought over 81,000 trees to the region since 1989—nearly 4,000 were planted in 2013 alone—and some of these trees even have a side effect: Fresh food. The Greening thus also volunteers with the Fresh Food Share program, so volunteers can either join in the planting, the tending, or the harvesting. Kalamazoo plays host to this unusual organization, who's actively seeking volunteers to join in the process of scientific discovery and the development of tomorrow's technology. While reports suggest that there was a particular need for volunteers to help make a move to a new facility in Kalamazoo—Geek Group's site suggests it has a Grand Rapids branch as well—there may well be room for a lot of other opportunities here in development and creation. Michigan is known far and wide for its harsh winters, and in the Upper Peninsula, that only increases. For some, finding a place to get in out of the cold can be a challenge. In Marquette, there's the Room at the Inn Warming Center, a place for homeless and other folks to slip in and grab a little warmth and shelter in the midst of the worst of Michigan's cold times. The Room at the Inn center migrates among 12 different hosting churches, and as such, always requires the support of well-meaning folks. For those over 60 who'd love to fill some younger people in on some of the issues that may be facing them, being an Advice Counselor with the Elder Wisdom Circle in Wyoming could be just the thing. A virtual volunteer slot, volunteers get requests for advice throughout the day and answer said requests as time is available. With people looking for advice on everything from career to child-rearing, chances are there's a slot ready to be filled with good advice. Elder Wisdom Circle operations are nationwide as well, so even if you're not in Michigan, there's still a chance to volunteer on hand. With the sheer number of lighthouses in Michigan, it was really only a matter of time before at least one of them would develop a kind association around it. The Fox Island Lighthouse Association, operating out of Traverse City, focuses on the Fox Island lighthouse. With several separate projects that ask for volunteers—from building maintenance to offering tours to visiting boaters, the Fox Island Lighthouse Association's demand for volunteers is fairly constant. The Upper Peninsula truly does have a volunteer spirit. In fact, there's so much of it that Northern Michigan University in Marquette offers an entire volunteer center devoted to disseminating opportunities for volunteerism. Those who want to get involved with anything from animals to families to senior citizens can find all the information that's needed right here, making it a prime target for the charitable. Those looking to help people get home safely have a great opportunity to do so in Kalamazoo with the eponymous Drive Safe Kalamazoo program. Offering safe, free, and non-judgmental late-night transportation—the program actually makes it clear that while it doesn't promote the use of alcohol, it does exist in the community, and the consequences of that existence may require services like those offered by Drive Safe Kalamazoo—the organization helps people get home whether they're broken down or, indeed, drunk. HandsOn Battle Creek—located in Battle Creek—is something of a unique animal, in that it offers a host of different opportunities all in one location. It also boasts trackers for total volunteers and total hours worked, as well as the value of these hours, showing just how much good the HandsOn Battle Creek volunteer efforts have done over time. So far, the organization has raised over 5,000 hours of effort over 1,090 members total. Popularized by the 2000 film of the same name, the Pay it Forward institution in Holland represents an unusual breed of volunteerism. It doesn't require a set commitment of time or the like, just a commitment to perform “random acts of kindness,” and leave behind a card directing the recipient of said random act to, as the name connotes, pay it forward. Instead of seeking to do something for the person who did the random act for the recipient, the recipient is encouraged to do a similar act for someone else. Anyone can get in on this, though registration is required to get the cards in question. Midland is the home to this highly-focused charity which deals exclusively with babies and their most immediate of needs: The diaper. Diapers can be tough to come by for those out of work, and even public assistance programs aren't always the greatest on this front. Enter the Diaper Alliance, which every month provides 60 diapers to 700 babies, for a combined total of 42,000 diapers every month. That takes a lot of packing and unpacking, which means volunteers will always be welcome.